Compared to the tundra to the north, Florida’s winter weather is paradise. However, winter does bring increased instances of bad weather, especially fog and rain, and when bad weather happens, so do auto accidents. If you drive in Florida winters, it is a good idea to be aware of the potential risks, as well as what you can do to protect yourself, so as to minimize your risk of liability if you do wind up in an accident at this time of year. Studies from the Federal Highway Administration (FHWA) analyzing roughly the past decade of data show a distinct correlation between bad weather, especially precipitation and fog, and several adverse conditions that are known to cause traffic slowdowns and diversions (which in turn cause traffic accidents). If one examines the tables, visibility, road treatment strategy, traffic flow and everything in between may be affected by various types of poor weather, and these may all contribute to distracted, upset and reckless driving. Indeed, the major causes of auto accidents, especially in bad weather, are almost all related to driver error. However, when it is wet, foggy or otherwise not normal weather, these driver errors get magnified into even more potentially deadly mistakes. Data from the FHWA shows that approximately 21 percent of all auto accidents in any given year are weather-related. The majority of these weather-related crashes occur on wet pavement – approximately 70 percent, with around 46 percent occurring during rainfall. Roughly 5,000 people die every year in bad weather accidents. While weather can play a major role in causing auto accidents, especially in an area like Orlando where it can change rapidly, it can actually be quite difficult to obtain compensation if you believe that someone else’s reckless conduct in bad weather led to your injuries. The problem with many personal injury cases is that too often, an insurer or defendant will be able to argue that the weather itself caused your injuries, rather than someone else’s actions in the bad weather. The latter would mean that the defendant or the insurer were liable; the former would not. While it can be difficult to prove that the weather played a role in your accident, it is not impossible. Florida law sets the statute of limitations (the time in which you are able to bring suit) at four years, so you have time to decide and to gather evidence that you can use to prove that the other driver’s conduct played a substantial role in your injuries. Having an attorney on your side is highly recommended, as an experienced lawyer may have tools at their disposal that you as a layperson might not have access to. While it is always a good idea to take care of yourself if you must drive in bad weather – to go slowly, keep your distance from other cars, and be ready for anything – sometimes accidents will occur anyway. 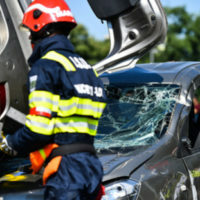 If you have been hurt due to someone else’s recklessness in bad weather, calling an Orlando car crash lawyer can help you determine how best to proceed. The Hornsby Law Group has experience with these types of cases and we are happy to try and assist you with yours. Call us today to schedule an appointment.